We hope your training and experiences at the UCI School of Medicine are rewarding and enriching. Many of our policies are described below. For further information, please contact us at the links provided. The Office of Graduate Medical Education sends out weekly emails, as well as monthly newsletters, with important information for our housestaff and program leadership related to accreditation, wellness, patient safety and quality improvement. This information may be referenced on our GME SharePoint site. You may reference your health benefit information at ucresidentbenefits.com. You may also reference this information on our GME Sharepoint site. This is a 24-hour phone service that provides support to physicians with alcohol/chemical dependency or mental/behavioral problems. This service is completely confidential and will not result in any form of disciplinary action or referral to any disciplinary body. The National Institute on Drug Abuse (NIDA) has launched a new website to provide physicians and other health professionals with the latest science on drug abuse and addiction. It contains resources for people struggling with addiction and their families, as well as relevant research, documented trends in addiction and other informational materials. The GME Office is highly invested in the promotion of wellness and resiliency in our residents and fellows. We offer resources, screening tools, workshops and events to educate and support our valued housestaff. The Coordinator of Faculty and Staff Mental Health Care and Respondent Services provides consultative services and support to resolve behavioral health issues, serves as a primary crisis intervention resource to facilitate and coordinate appropriate resources, provides time-limited case management for residents/fellows, and develops and implements instructional training and materials to assist in the promotion of mental well-being for all UC Irvine Health faculty and housestaff. Information shared with the Coordinator of Faculty and Staff Mental Health Care is completely confidential. Information about you or your visits is not shared with anyone without your consent or as required by law. This program is a free, confidential benefit that can help address personal or work-related issues faced by UCI faculty, staff, retirees and dependents. This service, staffed by experienced clinicians, is available 24 hours a day, seven days per week. A master’s or doctoral level Guidance Resource Professional will help with problem identification, assessment and referral to treatment providers and community resources. Guidance Resources can assist with concerns such as marital conflict, interpersonal difficulties, conflict at work, stress management, alcohol or drug abuse, and personal decision-making. Dr. Esther Park and Dr. Stella Kim are available to provide care to our UCI residents and fellows. They currently are in the Anthem Blue Cross Provider Directory which is the health benefits provider for our residents and fellows. Offices are located in Fullerton and Laguna Hills. The hospital offers chaplain services for house staff who are interested in spiritual and pastoral support. Meditation room, email support group and a basket for prayer requests at UCIMC are available. If there is concern that a resident physician suffers from impairment of ability to perform the expected duties according to acceptable standards of care due to substance use or a medical reason, any UC Irvine Medical Center or UC Irvine School of Medicine employee may refer this individual to the Well-Being Committee. This decision may be based on an observed decline in the quality of patient care and a significant shift in behavior or conduct. Resident physicians may also self refer. This referral may be initiated by contacting the Director of Medical Staff Administration (714-456-7435). Concerns about the health of a physician also can be referred for confidential consideration by the Well-Being Committee. The committee serves as a resource of information and also provides advice, recommendations and assistance to individual physicians and to groups or committees that request help. For more information, please refer to the "Impaired Physician Program and Guidelines" document on the GME Sharepoint. The Wellness and Resiliency Committee is composed of residents and faculty from all departments, as well as other staff members invested in the prevention of burnout and the promotion of wellness and resiliency in our UC Irvine physicians. The committee meets monthly. Please contact the Chairs of the Wellness and Resiliency Committee, Dr. Patrick Lee and Dr. Deena McRae, if you are interested in joining or would like more information on resources. • General Support Group: We are currently placing a brief hold on these meetings due to low interest/attendance. However, we plan to resume meetings in 2018. If you are interested re-starting sooner or have other ideas, please contact our Wellness and Resiliency Program Chairs, Dr. Patrick Lee and Dr. Deena McRae. • LGBTQ Support Group: Monthly meetings are continuing. Please contact Dr. Cristobal Barrios for more information. Mindfulness for stress reduction, Yoga and Tai Chi are available through the Susan Samueli Center, free to UC Irvine residents and fellows. Through the use of heart rate monitors, the participants can see in real-time the positive effects of breathing exercises, meditation, and exercise on their bodies. Free sessions are available for faculty and housestaff. There is an array of individual and group sports and fitness options at the Anteater Recreation Center (ARC) as well as other activities where you can connect with other UCI community members. A comprehensive website with a list of upcoming events, available classes and workshops, online video modules, tools and resources to promote wellness and work-life balance. This is an online resource just for UC Irvine Health employees with informational flyers, helpful articles, discussion boards, a list of upcoming programs and events, and available resources. Self-directed, online video programs for improving your mind, body, spirit and environment. • UCI Wellness YouTube Channel: The official YouTube channel for UCI faculty, staff and retirees. Enjoy a variety of playlists covering fitness, nutrition, mental health, and financial wellness. • UCI “Wellness Adds Up” Video Library: Educational and activity videos created for and by UCI on a wide variety of health and wellness topics. Topics include strength, flexibility, stress management, nutrition, sustainability and motivation. • UC Well-Being Channel: Presented in partnership with the Chopra Center for Well-Being, Jiyo and the UC San Diego School of Medicine. G320 Student Center; Hours: M-F, 8 A.M.-5 P.M. If you have experienced sexual assault, dating/domestic violence, or stalking, you may contact Campus Assault Resources and Education (CARE). This organization offers services related to sexual assault, dating and domestic violence, and stalking FREE of charge and CONFIDENTIALLY to all students. Services include consultation about options, advocacy, accompaniment, group counseling, yoga programs for survivors, community resource referrals, and training programs for students, staff and faculty. To report an incident, contact the UCI Police Department at 949.824.5223. Times and dates will be publicized by the GME Office regularly. Please contact GME office for updated times and locations (gme@uci.edu, 714.456.3526) or email Dr. Cristobal Barrios. This center provides a safe and welcoming environment for the diverse lesbian, gay, bisexual, transgender, queer, questioning, intersex, and all communities. This organization sponsors social events, lectures, discussion groups, and political activism and provide information about the campus and community resources in the Orange County area. A social/discussion group for LGBTQ faculty, staff and graduate students. UCI offers students, residents and faculty six options for childcare ranging from an Infant/ Toddler Center to a Montessori school. Many of the programs offer subsidized rates for UC Irvine students. This is an organization dedicated to helping families in financial or emotional crisis to be successful and self-sufficient. UC Irvine Health has Medela hospital-grade pumps for staff members to use while they pump at work. Employees are responsible for purchasing their own Medela double electric breast pump kit. Keys are available from the atrium main lobby information desk on the first floor. After 9:30 p.m., a key can be obtained from the security desk. This room is located inside the changing room. The pump room is for OSS/GI employees only. The keys are available from Human Resources in suite 800. UC medical plans provide a variety of breastfeeding support resources including nurse lines, counselors and online programs to help you if you have questions about breastfeeding. If you are covered by a UC medical plan, breastfeeding support, supplies and counseling may be available at no cost. 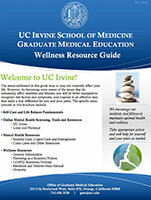 Offered at no cost by UC Irvine Health to all UCI faculty and staff. Offered at no cost to all UCI faculty and staff. Classes include: Expecting Parents, Parenting Resources 101, Infant and Child Fist Aid & CPR, SCholarShare, and more. This is an anonymous online mental health resource that provides self- assessment tools and fact sheets. Helpful information and resources are provided, covering a wide range of topics including general stress and anxiety as well as depression, substance use disorders and suicide. The American Medical Association offers high quality brief modules that are easy to complete and provides valuable information and tools. The Accreditation Council for Graduate Medical Education (ACGME) is focused on creating a learning environment with a culture of respect and accountability for physician well-being. The Council is focused on five key areas to support its ongoing commitment to physician well-being: Resources, Education, Influence, Research and Collaboration. Mood Gym is an online workbook based on the principles of cognitive behavioral therapy and interpersonal therapy, and an excellent resource you can use at home. Developed for medical interns, Mood Gym provides tools to cope with depression and anxiety. • Head Space is an app that focuses on teaching meditation and mindfulness in 10 minutes a day. • Moodkit is an app developed by psychologists to help improve mood. All housestaff members are required to complete an annual learning module on sleep, fatigue and alertness management. The GME Office offers a transportation reimbursement program for all housestaff. Members are encouraged to call a transportation service if they feel too sleepy to drive home safely. To be reimbursed by the GME Office, housestaff members must complete a reimbursement request form accompanied by original receipts and turn it into the GME office within 30 days of use. The Resident Transportation Reimbursement request form is available on the GME Sharepoint site. It is the general policy of the university to facilitate the resolution of complaints and grievances arising from appointment with the university. UC Irvine strongly encourages residents to report all grievances and complaints directly to their program leadership (e.g., program director, program coordinator, faculty director and/or department chair). Residents wishing to file a grievance with the GME office should contact the GME Director and submit a written complaint. The Director will contact the DIO, who will meet with the resident and conduct such investigation as may be necessary to obtain the relevant facts and formulate a solution. If the offered resolution is unsatisfactory, the resident may seek review of it by the Senior Associate Dean of Medical Education. The Senior Associate Dean’s decision regarding any grievance will be final. This process is in addition to any rights the resident may have pursuant to departmental policies; the University of California, Irvine Whistleblower Protection Policy; the resident’s right to seek assistance from the UC Irvine Office of Equal Opportunity and Diversity (OEOD), or any other University of California, Irvine office or official. The GME administration at the School of Medicine wants to hear your ideas, feedback and concerns. Our anonymous feedback system enables house staff members to provide feedback about their training experience 24 hours a day, 7 days a week. All information received is 100 percent anonymous. There is no tracer to any computer or email address. When submitting a message, please provide specific information related to any ideas or concerns about their training experience. If you would like a direct follow-up and response, please leave a name, pager or cell phone number, as well as the program name. If the message is to remain anonymous, simply leave out the program name and identifying specifics. SUPERVISOR RESPONSIBILITIES: It is your responsibility to ensure all incidents/ injuries/ illnesses and accidents are timely reported to Campus WC Office. Follow through with employee to ensure forms are promptly completed. Assist employee in obtaining medical treatment, if necessary. All exposures should be reported to an occupational clinic. Report Injury/ Illness: must be reported within 24 hours to Campus Office. EMPLOYEE RESPONSIBILITIES: review with each new hire and thereafter annually. Darlene Rivas, Workers' Compensation & Disability Coordinator, Initial Point of Contact, (949) 824- 9152. Ingrid Fahr, Workers' Compensation & Disability Consultant, SOM Liaison, (949) 824-7008. Contact House Supervisor 714-456-8455/pager 714-506-6000. Immediately report to your supervisor and contact Occupational Health at 714-456-8300 to receive medical evaluation and treatment. If you are injured while on duty, you must immediately report to LBMMC Employee Health Services to receive a medical evaluation and treatment. All injuries and illnesses will be evaluated in Employee Health Services at 562-933-1600. Contact House Supervisor at X 35630 or pager # 17242. OMS Staff are on call and will respond within 20 minutes. GME will be notified of your injury/illness and work status. Medical Emergencies (life-threatening) should Report to the Emergency Room. At UC Irvine Medical Center, faculty, nurses and housestaff have an objective way to know how to identify a resident's required level of supervision. This resource is called our Resident Competency Database. Report your near-misses and good catches into our Safety and Quality Improvement System. Reporting into SQIS not only provides full protection from disclosure but also allows our quality and safety teams the ability to further investigate issues that may lead to improvements in the system and our practice that help provide better patient care. Information reported into SQIS helps the organization identify potential system improvements through intensive review and root-cause analyses (RCA). This allows us to develop ways to prevent serious future errors. Housestaff and faculty safety officers are required to attend these monthly meetings. Program Directors are also strongly encouraged to attend to ensure that they are aware of hospital safety initiatives. Program directors and chairs should protect 10 minutes every month before a conference so that faculty and housestaff safety officers can share important information. You only need to attend one session. You must sign up with Kathryn Kennedy (kennedy@uci.edu) in the GME Office for the yellow belt certification classes at least seven days prior to the desired class. View information about parking passes — and whether they are accepted on both the Irvine campus and the medical center — at http://www.parking.uci.edu/permits/reciprocity.cfm. Note: This is police dispatch. Specify emergency or non-emergency. There are four core competencies required for medical students: Knowledge, Skill, Altruism, Duty. These four core competencies map to the 19 School of Medicine program objectives. Each course and clerkship has learning objectives that are driven by the 19 program objectives. The required clinical experiences for each clerkship can be also be found on the page with the clerkship objectives. The GME Office supports our residents who are parents. Here is some info on lactation resources at the medical center! Our UCI lactation consultant is Patty Carlton, who can be reached at 714.456.3920 or pcarlton@uci.edu.